Even though this album was released two years ago, I still want to write down my thoughts on it. There are several reasons. First of all, the quality of the Aural Art. I will come back to this immediately. Also of importance is the fact that Frozen Light recently released the successor of this album. In preparation for my review on that new album, which is called моменты (‘momenty’, meaning ‘moments’), I prefer to come back on this former release first. Exit In Grey hail from the Russian Federation and were formed at the beginning of this century by Sergey Sukhokiv aka [S] and Stanislav Wolkov aka (S). The latter left almost ten years ago. As from then on, [S] remained as sole composer. He is (or was), by the way, the same guy who composed under monikers like Sister Loolomie, Five Elements Music, радиосон, and some other short-lived, few productive but attractive projects, as well as he is the person who runs (ran) labels like Still*Sleep, Daphnia Records (created for his releases as Exit In Grey, now defunct), Semperflorens and the short-lived Teta-Morphosis. 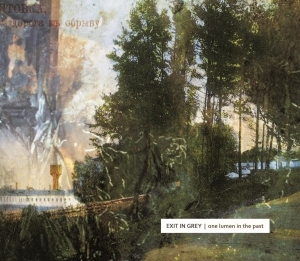 One Lumen In The Past was recorded entirely by [S] in 2011, but it took until 2016 before getting released properly, indeed via the great Frozen Light label from Moscow. FYI: the album was remastered for that release specifically in 2015, by Oleg Hurvatov (who ran the label InterioRepertoR, and the musician behind projects like Interior Disposition or Exploplasmatic Coagulation). It appears in digifile limited to 300 hand-numbered copies, including very original, somewhat unusual artwork, also designed by [S]. The album consists of three lengthy tracks, clocking forty minutes. One Lumen In The Past opens with the title song, which clocks 16:28 minutes. It starts in a very haunting way. An eerie monotone sound glooms in the dark, soon joined by different layers of spooky synths and guitar drones. Step by step, this opening track grows, climbing up by adding new elements, effects, sounds, field recordings and sonic manipulations. With an asphyxiating precision, all those different aspects fuse into ambient fields with a cinematic noire character. As from half of this composition, things turn even deeper and further into levels of discomfort and distortion. Noises from unknown dimensions, hidden secrets from beyond space and time, make this whole listening experience breath-taking yet, at the same time, so intriguing. Towards the end, everything builds up towards an ecstatic wall of ambient bombast and droning drama, like a harbinger of pyroclastic destruction. Old Letters And Visions (12:37) immediately continues within that breath-taking atmosphere. Like a post-life soundtrack, caused by Lovecraftian evil, this aural adventure takes us to the knowledge of our death to come. It focuses on our helplessness, impotence of leading our own life. Hypnotic melodies by (prepared) guitar and huge amounts of sounds and effects, create a sinister yet also enlightening vision of introspection and melancholia. As if a train passes by, untouchable and too nearby to decipher the details, this track deeply catches. At 2/3rd, with attention for detail, alien flutes and symphonic orchestration darken this experience, leaving the protagonist confused. The last creation on this album, Whispers Time, is the shortest (what’s in a word) with its 11:24 of length. Both uncanny and hypnotic, this piece is a beautiful representation of this story painted by Exit In Grey. Less frightening, yet as least as woeful and alleviating, this closing chapter takes us to the Inner Self, awakening and provoking. Fine-tuned guitar riffing and floating sounds get permanently injected by heavy-livid droned, sorrowful melody lines and lots of sometimes quite unexpected yet appropriate field recordings and sound samples.